Can you describe your therapeutic approach for teaching social learning? If there is no delay in speech or language, how can a speech pathologist and social communication therapy help? How are social communication groups and social learning groups different? I’m not sure if this describes myself or my child. What are some of the signs of social-cognitive challenges? How do the concepts and skills learned at Communication Works generalize out of the clinic setting? How old are the clients in social learning groups? Do you incorporate typical peers into the group sessions? Do you have a schedule for when groups start and end? How do we join a social learning group? Do you provide individual social communication therapy? What if I or my child is not ready for a social thinking group? My child hates social groups. How do I get him to attend or participate? What if my child has behavioral challenges when sharing space with peers or do not stay with the group? What is the cost of the programs offered at Seven Bridges Therapy? Are we charged for the group if absent? Does Seven Bridges Therapy accept insurance? What other services does Seven Bridges Therapy offer for social learning or related social skills? What makes Seven Bridges Therapy different from other programs of other organizations? 1. Can you describe your therapeutic approach? Much of our teachings are based on a group of leading specialists in Social Thinking® social communication, and self-regulation including Michelle Garcia Winner (Social Thinking®), Leah Kuypers (Zones of Regulation), Dr. Barry Prizant (SCERTS), Dr. Stanley Greenspan (DIR/Floortime), and our own lessons that we have developed over our years of practice. Michelle Garcia Winner (www.socialthinking.com) is a local groundbreaking therapist and author who specializes in the treatment of individuals with social cognitive deficits. Winner coined the term Social Thinking® to describe the ability of an individual to consider the points of view, emotions, thoughts, beliefs, and intentions of others. Winner’s approach, which we embrace and expand upon in our groups, uses very functional ways to break down and teach abstract social-thinking concepts. For example, we support her idea that “our eyes have thoughts” and that a client can determine what others are thinking by following their eye gaze. Here at Seven Bridges Therapy, we teach our clients how to be “social detectives” or “social spies” in and out of the therapeutic setting. We help them learn how to use their bodies, brains, eyes, and words to connect with other people, as well as how to understand the perspective of others and how they can influence those perspectives. We help our clients learn about friendship, how to make a positive impression, and how to deal with the “boring moments.” We use visual cues and fun activities to practice these concepts and many others. Our clients thrive on visual cues and positive reinforcement. We set them up for success, catch them in the moment and praise them for sharing “expected” pro-social behaviors or having a “thinking of others moment.” Many of our clients are labeled the “trouble maker” or “lazy” and become accustomed to negative attention, as social-cognitive deficits can often be an invisible disability. It is our goal to break that pattern and help them have more positive social experiences. To address self-regulation, we integrate The Zones of Regulation curriculum developed by one of our occupational therapists, Leah Kuypers. The lessons and learning activities are designed to help the clients recognize when they are in the different Zones (states of arousal) as well as learn how to use strategies to regulate the zone they are in. In addition to addressing self-regulation, the clients will be gaining an increased vocabulary of emotional terms, skills in reading facial expressions, perspective on how others see and react to their behavior, insight on events that trigger their behavior, calming and alerting strategies, and problem solving skills. 2. If there is no delay in speech and language, how can a speech pathologist or occupational therapist and social learning therapy help? Those with social cognitive deficits may have developmentally appropriate communication skills yet be unable to successfully apply those skills in the real world. If you or your child has difficulty with self- regulation and/or social learning, there is often a struggle with the use of language and feeling comfortable in social contexts. There may also be difficulties engaging in appropriate social interactions and uncertainty on how to act, or “be” with other people. Our speech and language pathologists are skilled in working with all forms of language, including pragmatic language. Although you or your child may not exhibit a speech or language delay, social learning therapy can help if the need is to support or improve social communication. Our occupational therapists are skilled in working with sensory and emotional regulation. If self-regulation is a struggle, this can often be the source of the struggle. Being social, playing and “hanging out” is one of the most meaningful occupations in life. If someone is struggling with getting along with others, joining in with peers and participating in social events, our speech pathologists and occupational therapists can teach the client to better understand the social environment and how to navigate it with more ease. Clients without a diagnosis or those with one of Autism Spectrum Disorder (Asperger’s Syndrome, PDD-NOS), Nonverbal Learning Disorder (NLD), ADD (Attention Deficit Disorder), ADHD (Attention Deficit Hyperactivity Disorder), or other language disabilities including those with undiagnosed social learning challenges or social-cognitive thinking deficits, can greatly benefit from social learning therapy. 3. How can poor social thinking affect academic success? 4. How are social communication groups and social learning groups different? 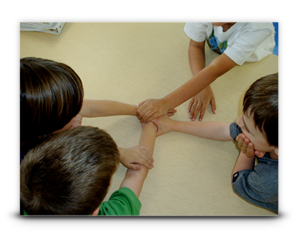 Seven Bridges Therapy offers groups that focus on social communication and/or social thinking. Social Learning groups are for clients that need support with attention and language. These groups focus on goals around the foundational components of social language and social thinking, including joint attention, initiating interactions, engaging in back and forth play/taking turns, sharing imagination, expressive and receptive language, and emotional regulation. Social thinking groups are for clients who are highly verbal and are able to think about thinking. We help them move toward thinking about the thoughts and feelings of others and how their behavior affects others. 5. I’m not sure if this describes myself or my child. What are some of the signs of social-cognitive challenges? Poor academics in areas of reading comprehension, history, writing, etc. 6. How do the concepts and skills learned at Seven Bridges Therapy generalize out of the clinic setting? Family involvement is an integral part of our program and helps lead to success. As part of each weekly session, we provide parent/caregiver/partner training during a portion of each session. This involves discussing the vocabulary, concepts and lessons that were introduced each week as well as ideas about how to carry-over skills learned in therapy in other environments. We provide a binder with written handouts to share with other family members, therapists and school personnel. Seven Bridges Therapy actively strives to provide on-going communication and consultation with all family members and professionals involved with our clients. We encourage weekly communication about what is going on at school, work and home so that we can incorporate any concerns or real life issues in our lessons. In addition, Seven Bridges Therapy is committed to incorporating community outings into our programs, during which our clients have the opportunity to practice their new skills in a real-world setting. 7. How old are the clients in social learning groups? Seven Bridges Therapy offers a range of social learning services and playgroups that accommodate clients from ages 3 to adult. Groupings are determined with great care by our therapists after a consultation and review of the client’s history is conducted. We also provide individual sessions for those who need more direct support. 8. Do you incorporate typical peers into the group sessions? Seven Bridges Therapy has a peer mentor program and actively recruits for age appropriate peers to participate, as needed and when appropriate. 9. How are the groups structured? Our groups are comprised of two to four (and occasionally five) clients who are matched according to their age, maturity, cognitive level, and level of social awareness. We are very careful to structure our groups to avoid anxiety for the clients involved and to ensure that the lessons are appropriately geared to all members of a group. Each group meets one to two times per week for 60 minutes. Each session concludes with a parent wrap-up during which the therapist goes over the lesson for the week and the concepts to be reinforced outside of the Center. This parental involvement is a crucial component of our approach and another differentiator that sets Seven Bridges Therapy apart from other programs. 10. Do you have a schedule for when groups start and end? Groups run year round. Seven Bridges Therapy can accommodate starting new sessions at any time if there are openings in current groups or a need to start a new group. 11. How do we join a social learning group? 12. Do you provide individual social communication therapy? Therapy increases in complexity across the years and is dependent on the cognitive, language and perspective taking level of the applicant. We recommend that you schedule a consultation with our directors so that we can best assess the individual’s readiness for either individual, dyad or group sessions. 13. What if I or my child am not ready for a social Learning group? We can help you determine your needs after doing an initial consultation.For some clients, it is helpful to start with individual sessions so they can learn some of the core vocabulary and concepts before they jump in with their peers. 14. My child hates social groups. How do I get him to attend or participate? We provide a safe, supportive and fun environment that most students find reinforcing and enjoyable. We incorporate individual motivators and interests, as well as humor, into each lesson. Our clients practice their new skills in engaging and interesting ways, including games, role-play, acting, watching movie clips, and going on community outings. Inevitably there will be “boring moments” in our weekly sessions, just as there are in life (and especially in school). We teach our clients how to get through these moments as well as the importance of attending during these moments. Our therapists enjoy their clients and the clients enjoy their therapists! 15. What if my child has behavioral challenges when sharing space with peers or do not stay with the group? If behavior is impacting a child’s ability to work with a group, we work to tailor the support for that student so that he or she is able to find successes. This may some include individual work on self-regulation as well as additional consultation with parents and teachers/professionals who work closely with the child and team. 16. What is the cost of the programs offered at Seven Bridges Therapy? Our rates vary depending on the number of clients in a small-group or individual session. For more information, please contact us to discuss your needs and availability for placement. 17. Are we charged for the group if absent? Our therapeutic approach rests on a commitment from all group members to be present on a regular basis. Lessons build on previously learned skills and often need to be practiced in a sequence for a client to be able to successfully generalize those skills. Thus, weekly attendance is crucial for making progress. However, we understand that the real world can intrude. To make life easier for busy families, Seven Bridges Therapy allows three absences per year (January to December). Each additional missed group will be billed at 50% of the session rate. If we do not receive payment for a missed group, we cannot guarantee the client’s ongoing participation in that group. This policy is in place not only to encourage continued and committed participation, but also because we continually have a waiting list of families waiting for social learning group services. 18. Does Seven Bridges Therapy accept insurance? Yes. Seven Bridges Therapy (Shannon Kong) is in network with most insurance companies including HMOs (Brown and Toland Medical Group and Hill Physician) and PPOs (UHC, Anthem, Blue Shield, Cigna among others). Call us and we can give you more information about what we offer. 20. What other services does Seven Bridges Therapy offer for social thinking or related social skills? If you are interested in a service not listed here, please contact us to inquire about availability. 21. What makes Seven Bridges therapy different from programs of other organizations? While many other organizations aim to improve social skills, Seven Bridges Therapy believes in a deeper approach that includes teaching and developing the critical thought processes that underpin all social interactions. As Lao Tzu said, “Give a man a fish and you feed him for a day. Teach him how to fish and you feed him for a lifetime.” We believe that if a person learns how to think about thinking and how to be social in his play, classroom, home, job, and community, the social skills he develops will serve him in all environments. In addition, we emphasize the role of the parent/caregiver/partner as a crucial and integral part of our approach. This involvement is a key factor in a client being able to carry over his new skills to all situations.